On 1 April 2016, a national living wage (NLW) took effect in the United Kingdom. This may come as a surprise to France, where the UK labour market is considered the epitome of a deregulated market. This new minimum wage, the NLW, adds 50 pence to the existing minimum hourly wage (the National Minimum Wage, NMW) for those over age 25, meaning a rise from £6.70 to £7.20, or 7.5%. This follows a 3.1% increase in the minimum wage in October 2015 for those over age 25 (from £6.50 to £6.70), for a total increase in one year of 10.8%. This sharp increase in the minimum wage does not represent a sudden change of course by the government. The Conservative election platform for the 2015 parliamentary elections already promised a raise in the minimum wage and pointed towards the introduction of a living wage. The announcement that the NLW would be established was made in July 2015, during the presentation of the budget by George Osborne, Chancellor of the Exchequer, following the Conservatives’ election victory. This is simply the first step in an effort to raise low wages, as the government has a target of increasing the NLW to 60% of the median wage by April 2020 (up from 55% at present), to about 9 pounds. This boost for low wages is part of a broader strategy of the British government: first, the government says it wants to “reward work”; not only has the minimum wage been increased, but eventually employees at the minimum wage level will no longer pay income tax (this was one of the Tories’ campaign promises in 2015). Furthermore, the government is taking measures to reduce taxes on business, including a symbolic cut in the corporation tax rate, which will be only 17% in 2020 (instead of only 20% currently), which will offset the increase in wages, at least for some companies (those that are most profitable). Finally, the government has set an ambitious target for reducing the public deficit, i.e. from 5% of GDP in 2015 to a balanced budget in 2020, in part by lowering public spending, particularly on social welfare. Raising the minimum wage would thus seem to be intended to offset, at least partially, a future reduction in benefits. The UK’s process for setting the minimum wage is well codified. Every year the government revises the minimum wage on October 1st, based on the recommendations of the Low Pay Commission (LPC), an independent body composed of academics and representatives of employee trade unions and employers. The UK has had a minimum wage only since 1999. It was implemented according to the recommendations of the Low Pay Commission at levels that matched the low wages of that time, after broad consultation with the business sectors concerned. The implementation of the minimum wage failed to spark waves of protests from employers, nor did it have a significant impact on employment, according to various assessments by the LPC over the years. The minimum wage level was initially low, and included separate rates for adults and young people. The LPC is mandated to produce an annual report on low wages and to make recommendations to the government on adjusting the minimum wage so as to ensure that low wages do not have significant adverse impacts on the employment of the employees concerned. The government has now also charged the LPC with monitoring the implementation of the NLW and proposing future adjustments, which will take place every year in April. The NLW applies only to those over age 25. The minimum wages of young people remain at the level set last October. There are currently five minimum wages: for apprentices (£3.30 per hour); for age 16-17 (£3.87 per hour); age 18-20 (£5.30); age 21-25 (£6.70); and over 25 (£7.20). These differences are substantial; the analyses by the LPC since 1998 have argued for lower wage rates for young people, so as to prevent them from being squeezed out of the labour market because of high salaries. This gap has won acceptance, unlike the situation in France, on the grounds that it promotes the growth of “odd jobs” for young people. The employment rate of British young people (15-24 years old) is very high (51.4% at end 2015, against 27% in France and 31% in the euro zone), and it is up significantly (it was 46.8% at end 2010). In its March 2016 report,  the LPC drew some initial conclusions on the possible impacts of the NLW. In April 2016, about 1.8 million employees (out of 29 million salaried jobs) benefited from the NLW, while in 2015 one million adults over age 25 earned the minimum wage. The NLW represents an increase in the annual salary of 680 pounds (for the average working hours of the persons concerned, 1360 hours per year, 26h15 per week). The impacts will vary greatly depending on the sector. It is in the service sectors that low wages are most common (40% of jobs are paid the minimum wage in cleaning companies, 30% in the hotel-café-restaurant sector, and 34% in hairdressing). According to the LPC, this year the implementation of the NLW will impact payroll by around 0.7 billion pounds over the full year, i.e. 0.1% ; raising the NLW to 60% of the median wage will cost another 2.4 billion pounds, which by April 2020 will represent 0.4% of the total annual payroll. These figures include a diffusion effect on the first 25 percentiles of wage-earners. The impact of introducing the NLW on wages paid will be close to 4% in the cleaning sector and 3% in the hotel-café-restaurant and hairdressing sectors. Assuming a similar diffusion effect, the Bank of England  also estimated that the NLW would lead to a gradual increase in payroll of less than 0.5% in five years. About 3 million people would receive the NLW in 2020. In July 2015, the Office for Budget Responsibility estimated that by 2020, the introduction of the NMW could result in the loss of 60,000 jobs, according to average assumptions of the elasticity of employment to its cost of – 0.4 , while also forecasting that over that same period the UK economy would create 1.1 million jobs. The national living wage is coming into force after several years of growth and job creation that has reduced the unemployment rate (by the ILO definition) to its pre-crisis level (5.2%), meaning that any job losses in certain sectors should be very manageable. Criticism of the NLW is currently coming from two camps: first, the trade unions are accusing the measure of further widening the gap between the wages of young people and adults; and second, employers, particularly in low-wage sectors, are warning of the risk of expanding the informal economy if the NMW is effectively increased to 9 pounds per hour by 2020, although the current level of the NLW is generally considered acceptable. 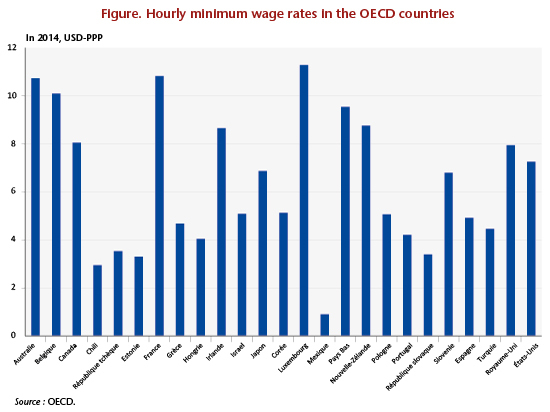 These adjustments in the British minimum wage have led the UK to join the ranks of the OECD countries with the highest minimum wage levels, although it remains behind France, for example (Figure 1). 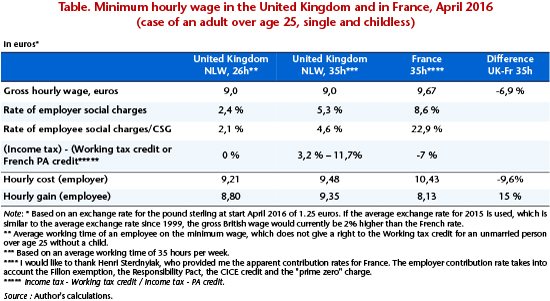 The new national living wage still leaves the British minimum wage lower than the French minimum wage (the SMIC, which represents 60% of the median wage). At £7.20, or 9 euros, the hourly rate of the British national living wage is currently almost 7% lower than the level of France’s SMIC. After taking into account employer social contributions, the hourly cost of the NLW is also below the SMIC, because, even though France has enacted important exemptions from employer social contributions (Fillon exemption, Responsibility Pact, CICE credit, prime zero charge) on low wages, social contributions are also very low in the UK. Take the case of an adult over age 25, unmarried and childless, who works 35 hours per week (Table). The hourly cost to the employer is 9.48 euros in the UK against 10.43 euros in France; the hourly cost to the employer falls to 9.21 euros in the UK if the employee works 26h15 per week, which represents the average working time of employees on the minimum wage in the UK. If we now consider the salary received by the employee, net of employee social contributions and income tax, the NLW is higher than France’s SMIC, especially if the employee works more than 30 hours per week, which makes them eligible for the Working tax credit, which is more generous than France’s prime d’activité credit. On the other hand, French employees are entitled to a much more generous public system of pension and unemployment benefits. The establishment of the national living wage in the UK thus represents an effort to catch wages up in sectors where low wages and part-time and precarious work are most common. This increase, in its current form, will have only a marginal macroeconomic impact on the British economy. As the aim is to reach 60% of the median wage, this figure of £9 is simply indicative, based on the projections of wage increases performed in March by the Office for Budget Responsibility (OBR). The OBR is an independent body that has been responsible since 2010 for performing the medium-term macroeconomic forecasts used for drawing up the UK budget and for analysing the UK public finances. See National minimum wage, Low Pay Commission Report Spring 2016, March 2016. Given the low levels of working hours and hourly wages, workers on the minimum wage earned only a quarter of the average salary at end 2015. The minimum hourly wage represented only 42.8% of the average hourly wage (£6.70 against £15.70). See Inflation report, Bank of England, August 2015. This elasticity corresponds to the median of the empirical estimates made using British data. Job losses rise to 110,000 if we use the hypothesis of an elasticity of -0.75 but are only 20,000 for an elasticity of -0.15. ← Can steel revive Europe’s industrial policy?